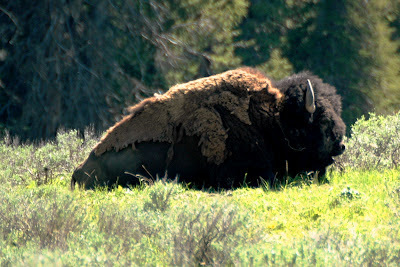 Hellgate Hunters and Anglers supports the re-establishment of wild bison in areas that can handle them. To us, that means large expanses of Public Land like the CM Russell National Wildlife Refuge, and The Upper Missouri River Breaks National Monument. We believe that there is ample room for these animals, and that by working collaboratively with landowners, livestock producers, hunters and other stakeholders, we can find a compromise that benefits everyone, and the Bison. When we started this blog, almost a year ago now, our message and our mission was simple. We wanted to provide a place where the policies and politics of wildlife management were front and foremost. We don't take partisan sides, we don't advocate for one elected official or another, but we won't shy away from calling out people who try to reduce our opportunity, and our wildlife populations and habitats. We hope you join us by becoming a regular visitor and liking our facebook page. It's the best way to get updates on this issue, and make a difference when it comes to getting these big shaggies back where they belong. It's simple; if a state like Utah, which leads the West in reducing opportunities for the average hunter and angler can have wild, free roaming bison - then Montana can find a little room for these big shaggies too. Send your thoughts to Governor Brian Schweitzer and let him know that Montanan's support open and honest attempts to increase wildlife abundance in Montana. Some people like to scare the rest of us with a whole bunch of "what if's" - The truth is this, Bison can be managed, and we can have a huntable herd all our own. Some have asked "what for?" The answer is simple, because it's right, and it is needed. Without some serious conservation efforts, Bison could be listed under the Endangered Species Act. There is a chance now to conserve the remaining wild, genetically pure Bison and while nobody with any serious interest in this issue thinks that we'll have millions of bison running around the West, folks do believe that we can keep an iconic animal, one that a bunch of Western Congressional Delegates feel should be the Critter that most symbolizes the west, from meeting an untimely end. The love affair with hating bison is only central to Montana. Other states get it. Bison should be embraced, and conserved. Write the Governor today and send a message that Montanan's can do this.